John Mayall (b.1933) came to fame during the 1960s as leader of John Mayall and the Bluesbreakers, the band which spearheaded the British blues boom in the second half of the decade and provided a platform for numerous instrumentalists who later found fame in other bands - notably lead guitarists Eric Clapton, Peter Green and Mick Taylor. Mayall's Bluesbreakers had chart success with several albums, most notably the 1966 LP Blues Breakers with Eric Clapton, but Mayall's blues purist approach, combined with the constantly changing personnel of his bands, prevented him from achieving pop star status. Nevertheless, he built up a solid following and was able to move to the United States at the end of the 1960s. He subsequently spent much of his career there, continuing to perform with various line-ups and occasionally reviving earlier versions of the Bluesbreakers with musicians from his 1960s groups. A detailed account of his career can be found on Wikipedia. John Peel first became aware of John Mayall's records when he was working in the United States. While working under the name John Ravencroft for the station KMEN in San Bernardino, California, Peel played Mayall's records; the Blues Breakers with Eric Clapton LP appeared in the station's playlist [ref] while the single "Parchman Farm/Key To Love" was number 9 in its "British Top Ten" of the week ending December 2, 1966 - an example of what Peel would later call his "fraudulent British chart", as the record never featured in the UK chart listings. 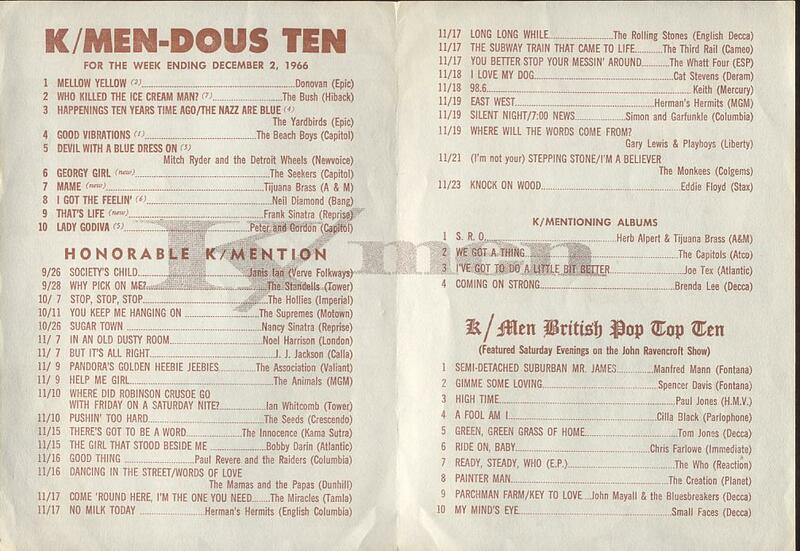 When Peel joined Radio London in March 1967 he continued to play Mayall records - especially on the late-night programme which eventually became the Perfumed Garden. A Hard Road, the current Bluesbreakers album and another chart success, became a staple of the PG playlists. He also saw the Bluesbreakers live, met Mayall and corresponded with him, referring to him with some affection during the programmes. Towards the end of the Perfumed Garden era, Peel remarked that Mayall was going to send him advance tapes of the next Bluesbreakers LP, Crusade, if they were ready in time, but this never happened and the LP was issued in September 1967, a few weeks after Radio London had closed down and before Radio One had begun. A solo LP by Mayall, entitled The Blues Alone, was issued in November, with sleevenotes by Peel. Mayall's popularity at this time was such that the Bluesbreakers were soon booked for a Top Gear session. It went out on 05 November 1967 on a show compered by Peel with Pete Drummond, and was repeated on 11 February 1968. A second session followed, broadcast on 31 March 1968, but these were the only sessions Mayall recorded for Peel (although the Bluesbreakers' first BBC session had been for Saturday Club in October 1965). The band gigged steadily during 1968, and Peel continued to play their records, but 1968 saw the peak of the British blues boom and Mayall no longer seemed at the centre of it. An important figure in this movement was Mike Vernon, who had produced Mayall's work and other blues records for Decca and (with help from CBS) founded his own label, Blue Horizon Records. Peel played many records from the Blue Horizon catalogue and several of the label's signings were among his personal favourites of the era. The first album by Peter Green's Fleetwood Mac, the band formed by Green after leaving the Bluesbreakers, was as big a chart success as any of Mayall's work. Their single "Albatross" topped the charts but was the first of many departures from their blues roots. Chicken Shack, led by the guitarist Stan Webb, also gained single ("I'd Rather Go Blind") and album popularity, and were admired by Peel, as was the one-man-band Tony "Duster" Bennett. These and many other British blues artists did Peel sessions in 1968-69, and the movement was parodied by the Liverpool Scene's song "I've Got Those Fleetwood Mac, Chicken Shack, John Mayall Can't Fail Blues". Musically, Mayall's bands began to change, with the inclusion of horn sections and influences from modern R&B and jazz putting them at a distance from most British blues and blues-rock bands of the period, which (following the success of Eric Clapton with Cream, the Jimi Hendrix Experience and the Jeff Beck Group) tended to be based around a flamboyant lead guitarist. Some of these bands developed into the hard rock and heavy metal groups of the 1970s, but most abandoned their blues influences. Mayall continued to lead different kinds of blues-based groups in the USA, but his records were less frequently heard on Peel's programmes. As well as Fleetwood Mac, a number of bands led by former members of John Mayall's Bluesbreakers recorded sessions for Peel. There were several led by drummers: Aynsley Dunbar's Retaliation, the jazz-influenced Jon Hiseman's Colosseum and the Keef Hartley Band, and McGuinness Flint (co-led by Hughie Flint and another band to have single chart success, with "When I'm Dead and Gone"). In 1995, Mayall appeared in the Peel-narrated Rock Family Trees: The Fleetwood Mac Story and Rock Family Trees: The British R&B Boom episodes of the BBC documentary series. Two sessions for Peel, as well as others for different BBC programmes. The Live At The BBC CD doesn't contain any Peel/Top Gear session material. 2. Recorded: 1968-03-26. First broadcast: 31 March 1968. Repeated: ?